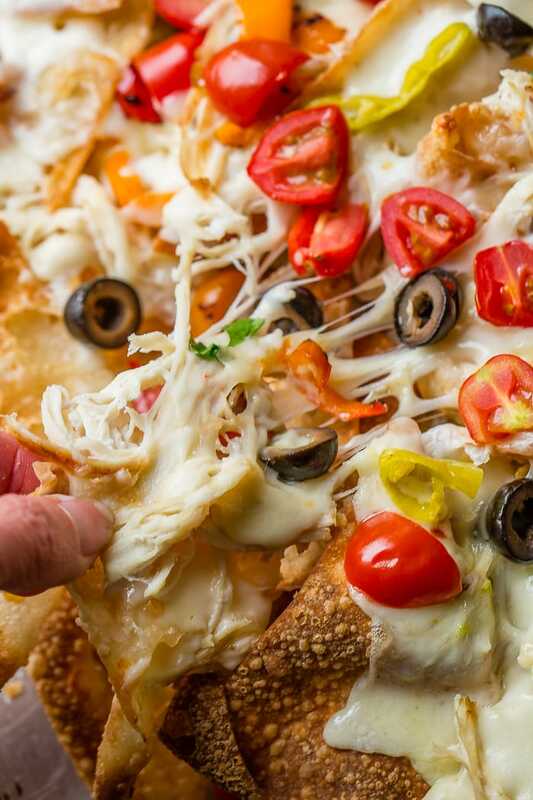 Crunchy fried wontons loaded with Alfredo sauce, shredded chicken, peppers, cheese and olives make up the most delicious Italian Nachos! 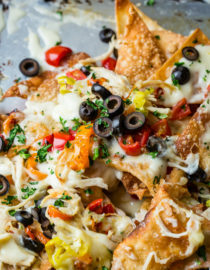 Italian Nachos.Being the food blogger that I am I obviously had to shake things up a bit and take your classic nachos to a whole new awesome. Years ago I had these yummy Italian nachos at a restaurant, and it was high time I recreated that recipe. 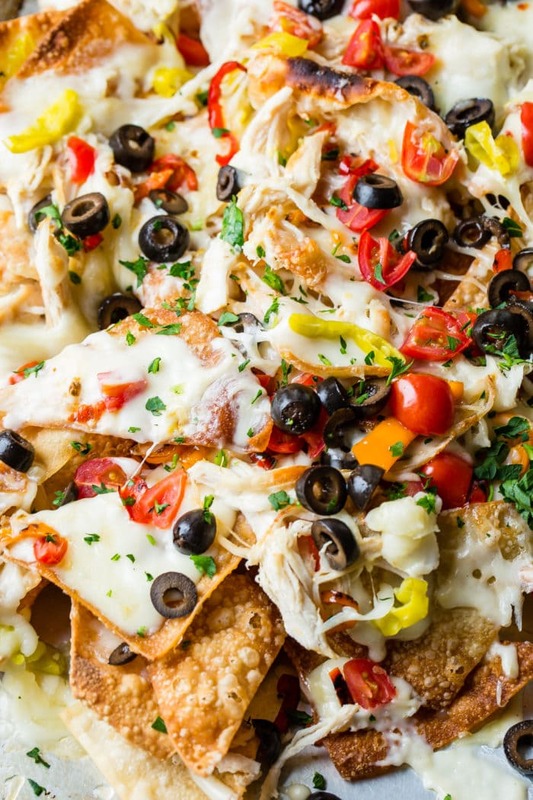 These nachos are so yummy, and while it’s sad to admit this at 9:30am while I’m writing this post, these sound awesome right now. It’s like I can taste the alfredo as I type. Isn’t alfredo and carbs so good?? 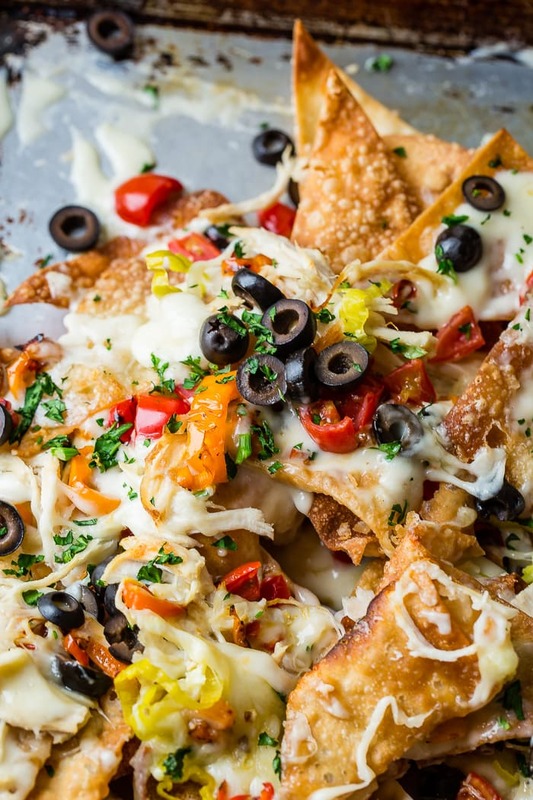 Italian nachos are fried wontons, creamy alfredo, mozzarella cheese, chicken, sauteed peppers, olives and parsley. I highly doubt that this is a dish you can actually order in Italy, but it should be. It’s really quite simple to make, but don’t let that make you think the flavor isn’t there. Oh how it is!! There are a few things I learned while making these. First, it’s smart to cook the wontons until barely golden. They will be going under the broiler so you don’t want them to get too dark. Also, these are great for game day or parties, and if that’s what you are making them for, may I suggest that you go the leftovers route? 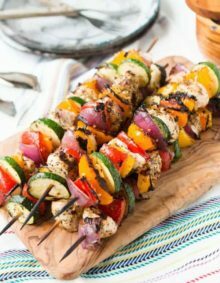 For example, the day before you could have chicken fajitas, cook up some of the chicken without seasoning and cook up extra peppers. 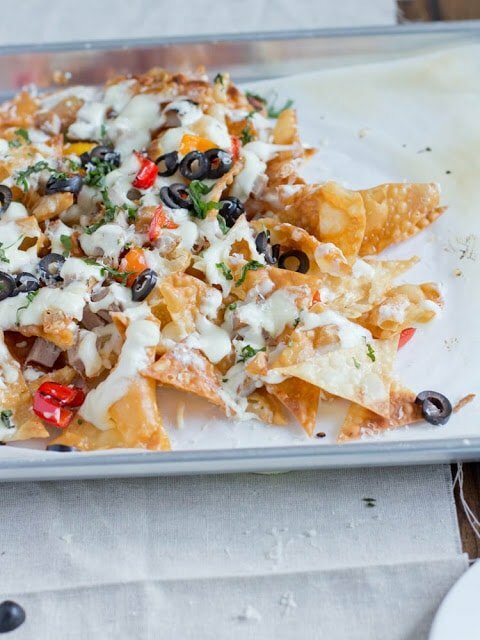 Leftovers can be saved for a day or two and then used in the nachos to save on prep time. Just make sure you make double the amount. If you’re looking for a few recipes try these, Philly Cheese Steaks, Penne Alfredo, Fajita Burgers, Philly Cheese Steak Egg Rolls. I’m such a sucker for all things dairy. I love the smooth, creamy alfredo with the stringy cheese. I love the little punch that the bright, sweet peppers give, and the salty olives. It’s the perfect combination of all things. 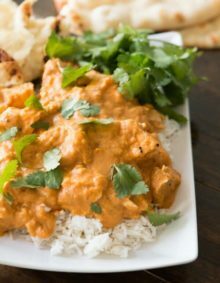 What Can You Substitute for Heavy Cream In Recipes? If your recipe call for heavy cream, but doesn’t require that the cream be whipped, you can use 3/4 cup milk plus 1/3 cup butter for l cup of heavy cream. If the cream needs to be whipped, this will not work, you will have to use heavy cream. Are Won Ton Wraps and Egg Roll Wraps the Same? Won ton wraps are an egg noodle dough. They are basically the same thing as egg roll wraps. How Do You Reheat Nachos? 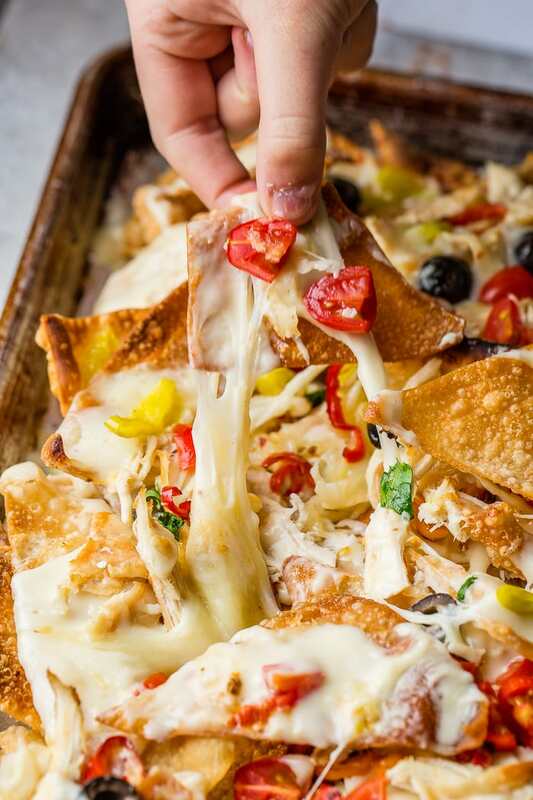 Spread nachos on a baking sheet. Bake for 5 minutes, or no longer than 10 minutes. In a sauce pot, over medium heat, add the unsalted butter and begin to melt. Stir in the garlic until the butter is completely melted. Quickly add the flour and continuously stir until it is clumped together and golden. Whisk in the heavy cream and half and half. Bring to a boil and then turn down to a simmer for 8-10 minutes or until thickening. Add the cheese and seasoning. *If you need to saute your peppers, just add them to a hot pan with a little oil over medium high heat. Cook, stirring occasionally, until tender. Heat the oil in a large skillet, oil about 1/3 of the way up, over medium high heat. Add the wontons one at a time and allow to cook until barely golden, flip and cook again. Line a baking sheet with parchment paper and then the wontons. Sprinkle with alfredo sauce, chicken, peppers, and mozzarella cheese. Place under the broiler in your oven until the cheese is completely melted, 5-8 minutes. Remove from the oven and sprinkle with olives, parmesan cheese and parsley. 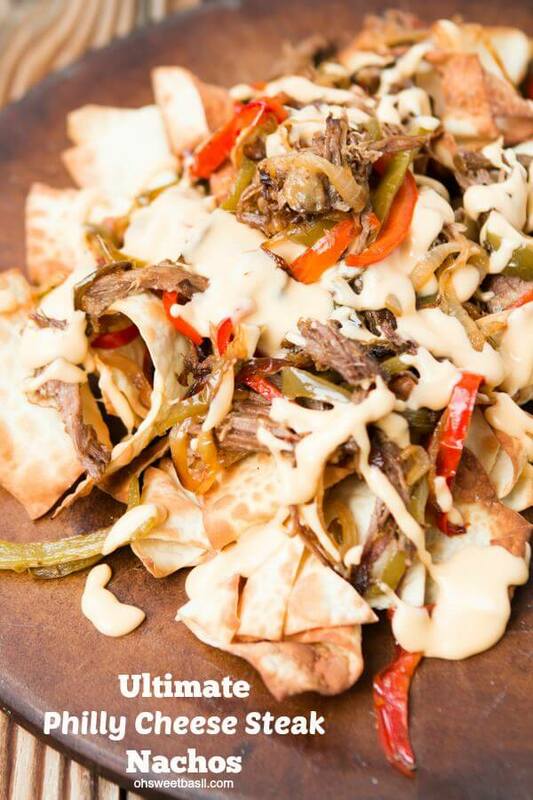 It’s your favorite Philly Cheesesteak in NACHO form!!! 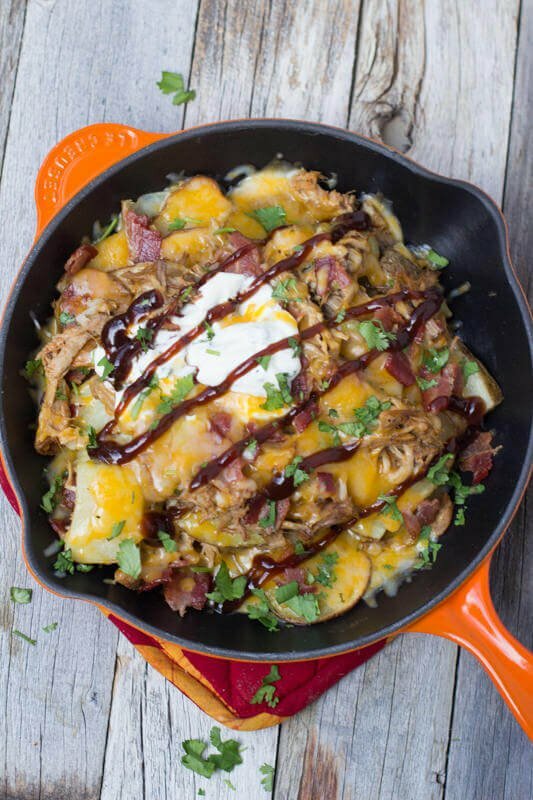 Potatoes, cheesy potatoes all covered in BBQ, bacon and deliciousness! 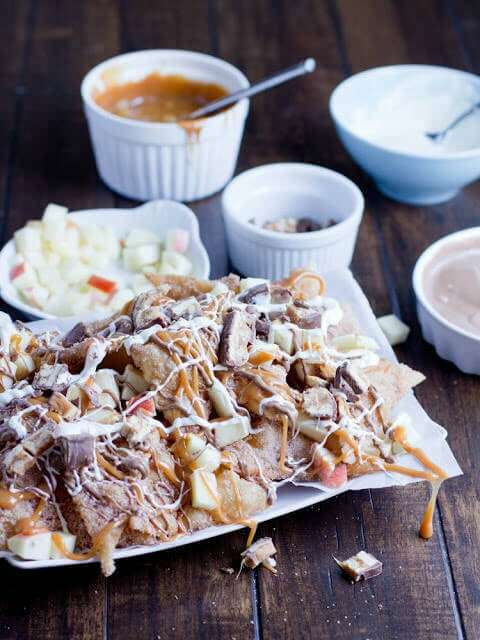 Those are some of the tastiest looking nachos I have have ever seen. I would dive into that platter and eat my way out. YUM! This sounds great, I love the Italian twist. Love the sound of these!! So creative. I am a nacho freak, and this has me drooling!! Using wontons is brilliant! I so need to try this. Using wontons is brilliant! I so need to try this! love this! 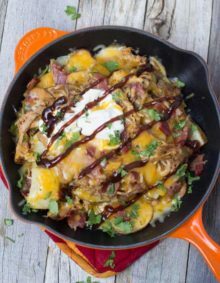 was just moving on from breakfast nachos and saw a version of “italian nachos” in the guy fieri cookbook (don't ask)… love the alfredo on yours…! those nachos look amazing!! i just want to shove a handful in my mouth! i love how it's just covered with toppings! Amazing, girl, just amazing! We eat nachos probably a little too often. These will be next on the list for sure! You had me at alfredo. And wontons. Genuis! I may just need to run to the store today. My daughter and I were just talking about how good the Italian nachos at Carrinos on. They look scrumptious. That looks sooo good. Gonna try it soon for Thanksgiving! Definitely a fun riff on an old appetizer! I'll have to try it before I recommend a wine though! Too many flavors to pick just from reading! What the what?!?!? This is amazing! I love this idea. 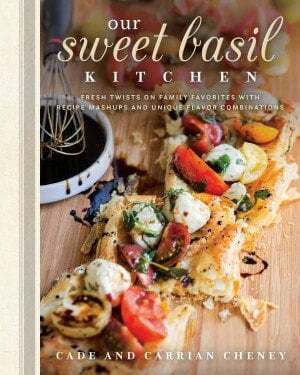 I am a huge nacho fan, I can not wait to try this twist. Yessss!! Italian nachos-I am on board! Mercy! These look so good this morning and it is not even 9 am!